Earlier this month, DutchMetalManiac’s Alessandro reviewed Prismind’s new album Disciples By Design here, he also saw their concert at the Rivoli Bar on June 8th, which he also reviewed. Now, as you can read below, he also interviewed Prismind! Guys, I’m very honoured to be granted this interview! I want to say again, I love your album. I hope my 11/10 at DutchMetalManiac means something for you! I try not to Google too much so where does Prismind come from? Kelly: Thanks very much for the opportunity, Alessandro! We’re certainly grateful that you enjoy the music enough to reach out! We are based out of the Hamilton, Ontario area (Canada). What am I even doing here….There is SO much talent in this band, so much experience! I don’t even know, as a rookie what to ask you: Kelly, an instructor and searing with Steve (Negus) of SAGA, Justin, playing with PORTNOY, Mike, mashing with ANNIHILATOR, John jamming with Big Sugar, The Trews and Finger 11… I mean how? Why? You’re after all…JUST Canadians aren’t’ you, eh? Kelly: I think we can all agree that we’ve lucked out with this lineup. I personally have never experienced this chemistry in a band before. John: Who says Canadians can’t rock? This is definitely not JUST another band for the four of us. Are you all actually friends or is it just business? Kelly: Definitely friends! There isn’t much that we don’t agree upon, so the business aspects are also handled with ease and agreement. John: I met Kelly before I met Justin and Mike. For me, it started when I hired Kelly to play some songs on a solo album I was working on. We continued to talk and stay in touch and eventually we became very good friends. Kelly, Justin, and Mike were in a band that was in need of a strong lead singer. I mentioned to Kelly that if he ever needed a vocalist that I would be there in a heartbeat. A few months later, I met Justin and Mike…we rehearsed, it was a perfect fit, and I was in. Since then, the friendship and musical connection have grown and surpassed all of our expectations. Justin: I’ve known Kelly for well over 20 years now. Throughout that time period we have played in countless bands together which really has paved a good foundation for our musical interaction and chemistry. When Prismind’s line up was finally solidified it was around the same time I met Mike and John. What I didn’t expect is how much we all have in common! Such an important factor especially in a band environment. Is the world a better place with all this new technology for spreading the gift of music or was it better to copy LP’s to cassettes and spread it around from garage to garage? John: Music is definitely more accessible now via technology. You can find anything without leaving your home. I don’t know if the world is better place because of it. I think it’s made it more convenient to find and buy music. I myself prefer hard copies of my music on cd and vinyl. The advantage of digital downloading is it has enabled bands like us to distribute our music globally without the aid of a label. Unfortunately, pirating music is still alive and well. Kelly: The technology has proven to be a double-edged sword. In the past, marketing and promotion were the tasks of marketers and promoters. These days, everyone has access to the tools needed to do this. Love them or hate them, but labels used to act as a sort of “filter”, where not every band on the planet was in your face. Now that everyone can do this themselves, there are millions of bands swimming by your news feed on a daily basis. So, instead of competing for a label’s attention, you’re now competing for the people’s attention. Musicians are generally not all the great at (or comfortable with) promoting, yet they have to assume that role now. We do our best to excel in that department as we can, and so far it’s working. Your music is powerful, heavy and intricate; tell us when and where your best times for inspiration are or come from? Kelly: From me, it’s difficult to say where inspiration comes from when writing. Very hard to pinpoint, because it’s never really from the same “place” from song to song. I guess I just gather inspiration from my bandmates, knowing their individual abilities and strengths. Recognizing the level that they’re at on their respective instruments makes it easier for me to write freely, and with confidence that they can pull it off, and add just the right parts. It’s quite liberating! You know how most bands will write 20 songs for a record and select the best 10-12? We didn’t do that because we didn’t have to; we wrote 9 songs for the album and made sure all 9 songs were strong. Justin: I’m very fortunate having Kelly, Mike and John to work with. Their musical contributions create a solid foundation for composing bass parts. Whether it be a lyric, a vocal melody, a drum section or guitar solo, it really inspires me to dig deep within the bass realm. Slaves to the Machine my fave track incidentally, a sociological cry out to the world or just a happy coincidence that technically, a band is slave to the drummer, yours, nicknamed ‘The Machine’? John: The song is not about our drummer Mike, as amazing and as precise as he is. The idea for Slaves To The Machine came from the notion of how we as a society have become slaves to our smartphones. We are owned by the devices we hold in our hands and our reality is based on the artificial world we activate through social media outlets. We “bow down” to them every time we turn them on. I do often ponder if there will come a time when smartphones will lose their novelty. Kelly: They will become a novelty only when something more interactive (and ultimately more invasive) comes along. 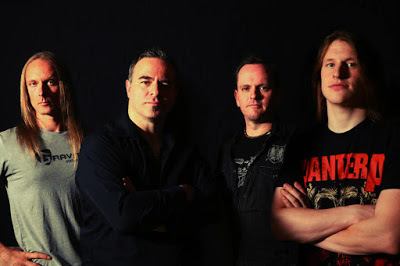 “Slaves”, from a writing point of view, was an attempt to create a “one note” riff, similar to Megadeth’s She Wolf or Black Label Society’s Funeral Bell. Simple riffs that stick in your head and carry the song. I think it works….though it doesn’t stay one note for long. Without being disrespectful to a band’s originality, I always like to cite some influences that my ear picks out or I think picks out; do you do this when you’re working out your arrangements? John: Not intentionally, no. Sometimes we can hear our influences when we are writing, but we are not consciously making an effort to duplicate them in our songs during the creative process. We do what comes naturally and our influences come out based on years of listening and playing. Kelly: So tough to answer! Too many to name. In terms of the bands that inspired me for this album, I’d have to say Megadeth, Dream Theater, Nevermore, and Haji’s Kitchen. John: My favorites would have to be The Who, The Beatles, Queen, Genesis, Jethro Tull, Yes, and Rush. Justin: I would have to say the bands that had the most impact on me is Rush, Dream Theater, King Crimson, Tool and Bela Fleck and the Flecktones. Recently I’ve been listening to Animals as Leaders. Onstage, 90% and live to fight another day or 110% and see what happens the next day? John: 110% with everything we do. Live, recordings, writing, visuals….everything is meticulously thought out. We take pride in our attention to detail in our music and presentation. Kelly: Definitely, and it’s still evolving. We are always debriefing about what works and what doesn’t after shows. We also record almost every show for critique purposes. Speaking of stages, you’re not on an especially heavy tour schedule as of yet; are there more dates lined up for this year in Canada? US and overseas tour planned? Kelly: No solid tour plans as of yet, though we are looking to do a series of shows. The networking wheel is turning and we’re working on it. Things will likely accelerate as the album continues to get out there. I want to thank you so much for taking the time for us! • WW III or Peace on Earth? • Aliens Land – Aliens Keep On Going? • Music Industry Better – Music Industry Worse? • Hamilton Blue Collar Pale Ale Better – The Rest …Better? John: I’m still waiting/hoping for world peace. Hopefully no WWIII, ever. The aliens are already among us! The Music industry…..I think we’re still very much in a period of flux. It’s going to keep changing and evolving as technology does….hopefully for the better, especially or the artist, with considerable fairness to the fans and music consumers. Kelly: No premonitions. We’ll find out when we get there! Thank you again for taking important time to talk to us. Do you have any last comments for DutchMetalManiac’s 2000+ readers? All the best success! Kelly: We’re just thrilled that you stumbled upon us and took the time to reach out! Thanks a ton for the interview and to the DMM readers for checking us out. Hope you like what you hear!